GMA News senior reporter Emil Sumangil has officially been named the new anchor of GMA News TV's afternoon newscast Quick Response Team. 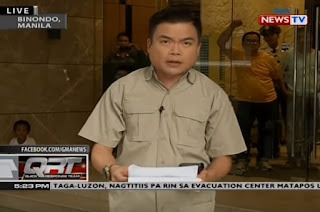 In a press release, GMA News touted Sumangil's extensive broadcasting experience, calling him "a veteran of the police beat covering exclusive after exclusive of the biggest headlines of the day." "From the perennial problem of congestion and drugs in our penal facilities, to countless anti-crime operations, to the recent sieges of Zamboanga and Marawi, Sumangil has been at the forefront many times — giving viewers an up close look by immersing in the conflict and plight of the personalities and regular people he covers," GMA News said in a statement. “We hope to give our viewers more quality stories produced through the efforts of the people in front and behind the camera,” Sumangil said in a statement. A longtime Kapuso, Sumangil has received numerous recognitions for his work in broadcast journalism, including an award for Outstanding TV News Reporter from the Volunteers Against Crime and Corruption (VACC) and a Gawad Justice Felix Angelo Award from the Philippine College of Criminology Alumni Association, Inc. Just this year, he was also named Best Field Reporter at the UP Gandingan Awards. Jiggy Manicad to run for senator under PDP-Laban?